Move-In Ready...Immediate Occupancy Homes Available! 421 W. 6th Street in Tempe, AZ. 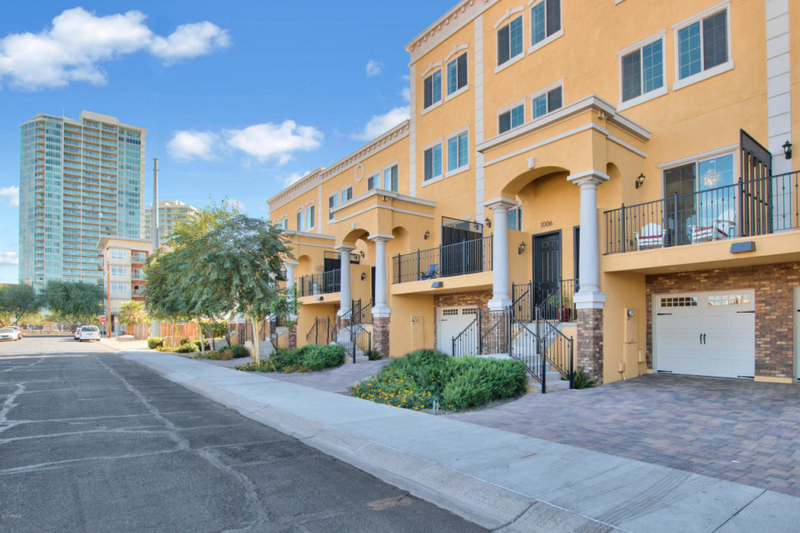 This 24 single-family attached luxury townhouse development in the heart of Downtown Tempe has homes ranging in size from 1,553 sq ft to 2,270 sq ft. The three and four level townhomes offer 2 and 3 bedroom en-suite (plus den) floor plans. Located on W 6th Street between Farmer Ave and Wilson St, these upscale residences are within walking distance to all of the conveniences that a discerning urban dweller desires. This includes the Light Rail, local bus lines, Tempe Town Lake, Gammage Auditorium, The Tempe Arts Center, ASU and Mill Avenue, which features countless restaurants and boutique shops. Living at 421 W 6th Street will afford homeowners the opportunity to become less dependent on the car, without sacrificing access to the Valley’s major employers, cultural and recreational destinations. The residences are designed by renowned architect Bing Hu of H&S International. They are a beautiful blend of a classic upscale exterior, with a refined transitional contemporary interior. The 3 and 4 story townhomes offer spacious open layouts with well-appointed 2 and 3 bedroom suite floor plans, with an additional office/den flex space. Each home provides 2 private balconies on the main level for outdoor enjoyment, 11 foot ceilings and a 2 car private attached garage that allows for direct entrance into the home. Enjoy the beautiful Zen garden centrally located in the development. The interiors are beautifully finished with hardwood floors, granite countertops, and Bosch stainless steel appliances. Buyers have the opportunity to personalize their new homes with a 3 hour complimentary interior design consultation, including but not limited to the flooring, cabinetry and smart home options.